We’ve all heard it again and again: The workforce is graying and the water industry is an excellent case study. Nationwide, 30 to 50 percent of the water workforce is expected to leave the industry in the next decade due to retirements alone. Some states, especially those with a larger percentage of small and rural systems, face even more serious shortages, in part due to significant pay disparities1 that make it difficult to attract candidates. More and more municipalities are also responding to the need to plan for their futures via apprenticeship programs. But for all our attention to this challenge in publications, conferences, and workgroups, are we making progress? Over the past two decades, we’ve seen campaigns and initiatives of varying scales to promote the value of water and make the profession more visible. From significant endeavors such as the Association of Boards of Certification (ABC) Professional Operator designation2 to a growing library of videos that illustrate what it’s like to work in water3, the industry has illustrated an ongoing commitment to making the sector more attractive for job seekers. Recruitment strategies are focusing on underrepresented populations such as women and veterans, leveraging technology, and creating innovative partnerships to successfully (according to the GAO4) bolster the workforce. It is within those low-tech collaborations that we’re seeing momentum. Many high school graduates may not be aware of water industry jobs available in their own communities, and even if they become aware, it can take a significant investment of on-the-job experience and education to obtain the proper knowledge and licensure to become an operator. This is why many state and local governments, community colleges, utilities, and water organizations have been collaborating to develop apprenticeship training programs across the country. The Indiana Alliance of Rural Water, for example, administers an apprentice program as part of a larger NRWA water sector apprenticeship initiative. Their apprentices train alongside experienced technicians while earning an entry-level wage, all in the interest of creating a more robust workforce for the state. Small and rural community water systems are less likely to be in compliance, have adequate resources, or have the wherewithal to keep good employees, which is why the EPA is leading these efforts. The Chesapeake Water Environment Association has been collaborating with the City of Baltimore to train young people for the water industry since 2015. The Baltimore City Water Industry Career Mentoring Program, now in its third year, is an eight-month program for 18- to 24-year-olds that provides water industry career exploration, worksite tours and job shadowing, connections with a career coach/mentor, a summer job at the Department of Public Works, and opportunities to interview for full-time, entry-level positions. Operator certificate programs are a more traditional approach to preparing students for the operator exam in their state. They can range from semester programs in a classroom to a completely hands-on technical training program, such as at the Environmental Resources Training Center (ERTC) at Southern Illinois University Edwardsville, where participants are prepared for both the water and wastewater exams in Illinois and Missouri. 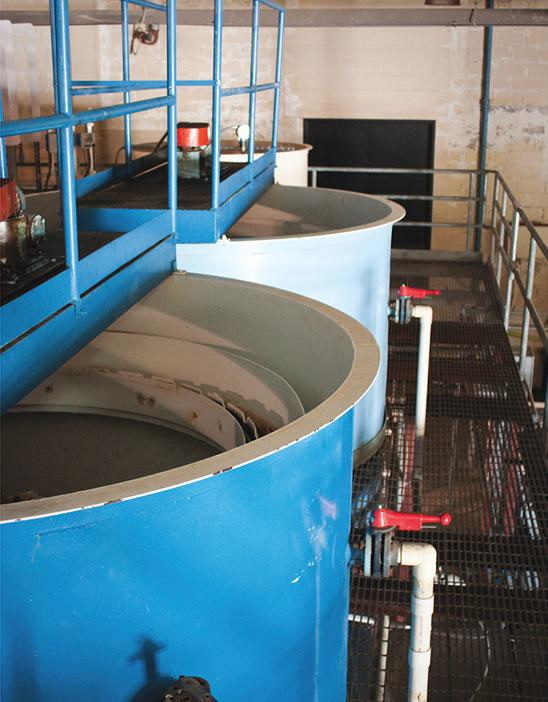 Students at ERTC spend nine months training at a fully functioning water and wastewater treatment plant before completing a required 10-week internship. Other recent initiatives attempt to recruit workers even before they graduate from high school. A youth apprenticeship program sponsored in part by NEW Water in Green Bay, WI, offers students the opportunity to gain valuable work experience and insights into the wastewater industry while still attending high school. NEW Water collaborates with the Greater Green Bay Chamber, Northwest Technical College, and area school districts for this program. More and more municipalities are also responding to the need to plan for their futures via apprenticeship programs. The City of Prestonsburg, KY, for example, has recently announced the creation of a three-year apprenticeship program. Their program partners with a local community college to reduce the time it takes to become a certified water or wastewater treatment operator, giving the city a competitive edge in the race to replace their retiring operators. This boom in apprenticeship programs illustrates an industry that has moved beyond giving lip service to the problem and started putting real teeth (i.e., financial investment) behind the strategies needed to sustain the water workforce. But of course, there is much more work to do. Many of these efforts are to support an individual utility and its own needs, but what about programs that support the industry as a whole ... or should the model be truly local? In November 2018, a National Workforce Convening was hosted by the U.S. EPA and a steering committee that included the Water Environment Federation, American Water Works Association, the Association of Metropolitan Water Agencies, the National Association of Clean Water Agencies, and the Water Research Foundation. Participants included individuals representing utilities, technical assistance providers, regulators, and other water and wastewater industry organizations across the sector. What the convening made clear is that our industry isn’t that much different from many others that are struggling with workforce issues. A presentation by the Transportation Learning Center highlighted the level of effort that has created a sustainable training program for the transportation industry. Though there are differences in jobs and details, the training provided through the center is an impressive model that the water industry should take note of. It would be a heavy lift to replicate their program, requiring regulatory changes in states for one, but it’s an ideal that we as an industry should look toward and embrace. One of the issues that surfaced was national certification and reciprocity. How do we find a way to get there, at least for some classes of certification? A number of speakers highlighted successful workforce programs for their utilities, including Atlanta, GA, and Fort Collins, CO. The take-home message for attendees was that these communities are thinking outside the box and making recruitment and retention the focus of their workforce development program. Common traits of these programs include building community within the organization, creating a sense of pride in the communities they are serving, providing transparent promotion possibilities to provide a career path, and engaging employees to be a part of the decision team. It was really about creating a culture change internally to make the job more attractive, create employee buy-in, and make the organization a great place to work. So what about small systems? Small and rural community water systems are less likely to be in compliance, have adequate resources, or have the wherewithal to keep good employees, which is why the EPA is leading these efforts. Some larger communities are stepping up, realizing that a number of their operators started at these small systems. Birmingham, AL, and Charlotte, NC, were both discussed at the convening. In these cases, the small communities are provided support that makes them more sound communities for growth, and the larger utilities are providing their young staff an opportunity to learn and develop. Small system compliance and public health protection are a critical component of the workforce agenda. The convening highlighted how there is so much going on with respect to workforce issues that there is no way any one person knows it all. A final action agenda, to be prepared by the EPA in early 2019, will compile information shared at the meeting to not only give individual utilities opportunities they can pursue, but provide examples of how to partner and work together to create a stronger water industry. Draft action areas are summarized in the infographic pictured. While these big-picture efforts draw attention to our sector, it will likely be coordinated actions at much smaller scales that will bring new talent into the industry. BAYWORK6, a highly lauded collaborative of 25 agencies in the San Francisco Bay Area, and the Upper Cape Cod Regional Technical School7 are just two of many models that will serve as a blueprint for building the post-boomer water workforce. Jennifer Wilson is based at the Illinois State Water Survey and has coordinated communications for WaterOperator.org and PrivateWellClass.org since 2010. Prior to joining the University of Illinois in 2008, she served as an environmental scientist with the U.S. EPA’s drinking water program. Jennifer has an M.S. in soil and water science from the University of California, Riverside. *Brenda Koenig and Steve Wilson contributed to this article.